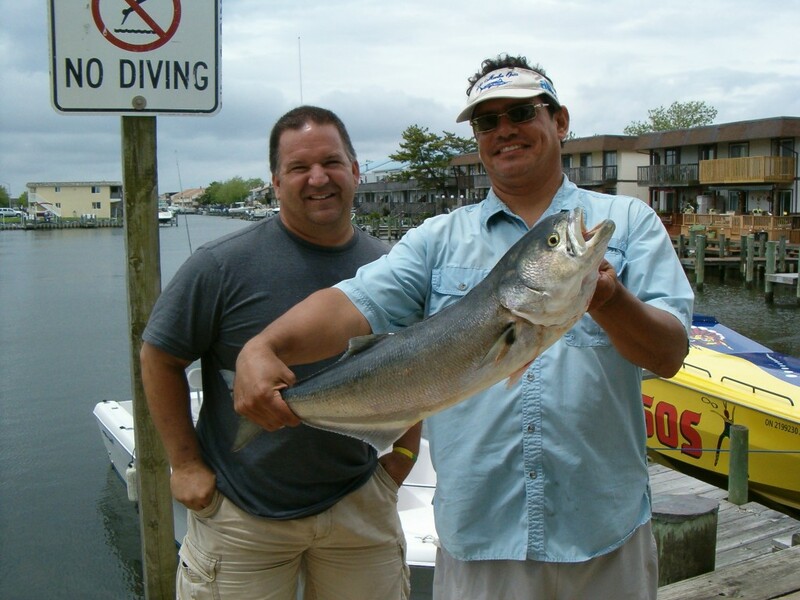 and Fenwick Tackle, Fenwick Island Delaware. are showing up the bay. Oyster Bay is now open summertime hours 6 A.M. till 10 P.M. daily. The  online mall is open. Fenwick Tackle locations. De Licenses are sold at our DEL location. MD fishing licenses are really quick and easy once you're in the system. already printed! I have had several e-mails about this. here without a MD license but you still need to obtain a free registry. We can do that for you at Oyster Bay Tackle or call 1-855-855-3906.
croaker, sharks, rays, and even some speckled trout! little small, but it shows the nearshore Reef Sites with numbers. 2013 Shark T's! In store or on Online. We also have the  2013 Shark Tank Tops. Got a few left. Get them quick. weakfish, a couple flounder, and a baby blacktip shark." and 1 34" dogfish on squid. Not much going on. was fishable. We ran into some shad on Saturday and Sunday night. and 3rd Street on Saturday. He caught 7 total, eight inches and up. Flounder and a Skate during their trip. morning tide on grass shrimp. weighing in at 4 pounds and 3 pounds. These pictures are in our  Inshore Photo Gallery. Ed's pictures are in our Delaware Photo Gallery. Trailhead Tire Deflators! We also carry the Oasis Trailhead brand. Fisherman reports on Saturday:  "The charter boat, "Get Sum"
Jetty during the outgoing tide. Water temp was 62-degrees. Head boat, "Bay Bee" had 4 keeper flounder during their morning trip. Channel. Largest measured 20 1/4-inches. duck blinds on Gulp! and minnows. small tiger shark and a small mako. day and Sunday had even more wind projected do it was a no go on Sunday. helbentcharters.com. See you on the water! rhythm that will help you keep you from getting hung up on the rocks. the 20+ inch range. There have been quite a few keeper rockfish as well. of fish. Have a GREAT WEEK, Dave." Check out his new web site. Flounder and Surf, Rig and Lure Packages, Selection of Swimming Shads or Gotcha Plugs! Capt. Monty on the "
Will See The West End Of An East Bound Boat..
Now 496 @ Ake's Reef And Growing..
fluke/flounder. Should start biting well in a few weeks. Capt. Monty Hawkins mhawkins@siteone.net Party Boat "Morning Star"
size. Flatties continued to come from Lewes Canal and Broadkill River. a 15 inch trout. Delaware Bay structure is also yielding some flatfish. jetties at Roosevelt, the Ferry Wall and Inner Wall were likely haunts. their limit of 140 bass and 26 plump ling Sunday on the Grizzly. Foundation. Come to Oyster Bay Tackle or buy  online. Check the weather before driving hours to go offshore or fish the surf. the weather and height of the waves. targeting the Croakers, Kingfish and Trout. special trip please give us a call at (302) 645-TUNA. His full report and boat info is here. Capt. Rick Yakimowicz Thelma Dale V catchfish@verizon.net"
bunker, bloodworms (real and fake), and surf clams are the best baits. be ready on the beach! Rays are a problem in the Inlet and bays as well. The flounder bite has picked up but you'll have to deal with the rays. White and Kieth Tolley fished the south side of IRI, back by the condos. Bill Jr caught a horseshoe crab, a turtle, a crab and 2 cow nose rays. everyone was catching blue fish, and that there was a blitz occurring. what he wanted. He said that six of them were in the 18 to 22” range. His picture is in our Offshore Photo Gallery. released by Tim Hawn while fishing on the charter boat, "No Quarter". 79-degree water. This fish earns Tim and the crew $10,000."